Hokuto Force is at it again as they've released another C64 game with a trainer, and boy does this one need it! 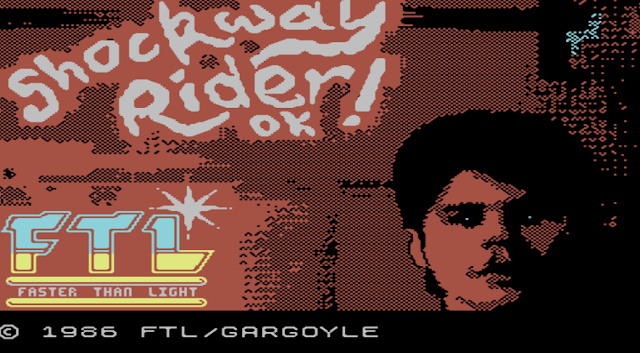 Originally from 1986 by FTL/Gargoyle, ' Shockway Rider ' is a futuristic game in which the speedy player must go through multiple districts using rapidly-moving side walks known as the Shockway. This also means you need to avoid citizens, objects and those that wish to attack you in a feat known as going full circle. It isn't often I rage quit in a retro game, sure I've done it in the modern Battlefield series, but Shockway Rider almost made me throw my keyboard out the window. Not only do you have to avoid the citizens using the Shockway to reach the finish line, but there are attackers in the game that swap from one lane to another just to knock you off. This is especially annoying as these attackers are not only hiding themselves in citizen clothing, but they are attached to you like glue and hard to shift. Although you can attack them by punching or throwing bricks, this still isn't easy and you still have to deal with other oncoming objects that come at you at rather fast speeds. But if you can manage that and listen to a really decent soundtrack, I'm sure you'll have a ton of fun! Thanks to Hokuto Force they've made the game much easier and more enjoyable by releasing it as ' Shockway Rider +6DGH ', which comes with 6 trainers, dox, speccy pic porting and a HS Saver.